but I've had enough for now. I sh'an't be gone long. Well, Mary Lee Mary (closest I could come to William Carlos Williams when I am this exhausted! ), what an emotional roller coaster this month has been--teehee. I hope to get back to read all of them once I settle back home from my road trip. Happy Poetry Friday! yes, I will come! I've had enough too and I could use a walk in the park. You did it! 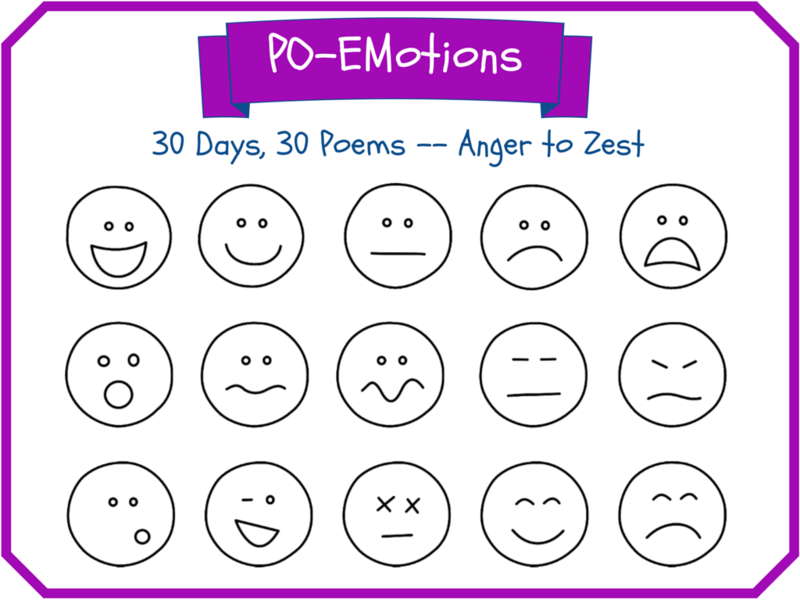 What an amazing month of poems! I would love to come along, too, Mary Lee. In fact, it really has been a feast this month. Thank you, thank you! I loved writing with you, Steve! Me, with you, too! Thank you! * There are a lot of emotions, some that shade into others, but still...! I was more attuned to some emotions than to others. It was interesting to see which ones drew poems and which ones were tougher for me. * Writing more poetry yields more poems. This seems like a "duh! ", but the push to write a lot was great for me. * The writing "prompt" helped me grow. Sometimes it seemed helpful to write about things that I might not choose to write about. * Writing caused me to go back and re-read poems to serve as mentors for new poems, which caused me to see them in a new way. * It felt a little bit risky to share writing that was barely dry behind the ears and not far enough out of my head to know how others might read them. * I need to find a consistent time and space to write. Habits are hard to make and break. * You're very good at finding a small number of words that pack a big emotional punch. Thank you so much for hosting this opportunity. I had a wonderful time writing with you. •This project seemed big and open enough to allow a better range of poems. The wonders of the world project last year was too narrow. •After writing a poem a day, I feel a little panicky when I don't write -- it's like I've lost a poem if I don't write. •I worked really hard this year to not write about the prompt "head-on." I'm proud of my slant looks at the emotions. •One of the best parts of the month was the community of writers. It's better to write together than alone. I, too, worked hard not to write too "head on" at the prompt. In fact, it was a lot of fun to try to think of a way to get there through a more circuitous route. I love the "lost a poem if I didn't write" idea. I'm not quite there....yet...but I hope to get there soon! I feel this too, And I agree that I have felt that panic and a little loss that I am not writing every day. And the community of writers is the best.